Compact Disc: Evanston Symphony LIVE! 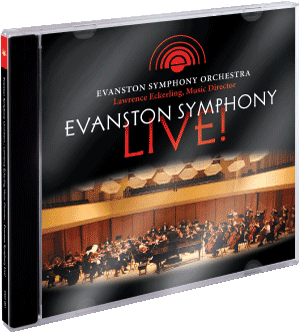 The ESO’s CD, Evanston Symphony Live!, is now available. © 2011. Evanston Symphony Orchestra Association. All rights reserved. Buy your CD online now! Purchase online through PayPal for only $17, including shipping and handling. No PayPal account is needed. The 2010–11 season marked the 65th anniversary of the Evanston Symphony Orchestra as well as the world premiere, on January 30, 2011, of The Promised Land (Songs of the “Next Life”), a song cycle composed by Gywneth Walker specifically for the ESO and gifted soprano Michelle Areyzaga. The combination of the currently strong artistic standing of the orchestra and this world premiere provided the impetus for this, the ESO’s first CD. The May 8, 2011, concert supplied an additional three great American compositions: Bernstein’s Candide Overture; the Suite from Howard Hanson’s opera Merry Mount; and Gershwin’s Rhapsody in Blue. Finally, an archive tape from the February 2008 concert provided a performance of Overture with Fanfares by composer and ESO bassoonist Donald Draganski, which was commissioned for the ESO’s 50th anniversary and received its world premiere in 1996. The program as a whole — five American compositions of the 20th and 21st centuries and two world premiere pieces never before recorded — exemplifies the ESO’s mission to educate its audience and to expand the concert repertoire. All of these performances are a tribute to the dedication and professional spirit of the volunteer musicians of the ESO.